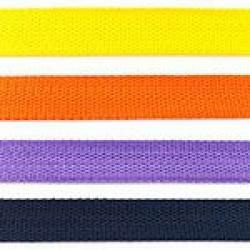 Our webbing ribbon is available per meter in the width of 25mm. You can make bag handles from webbing ribbons. Webbing Ribbon 25mm - Dark Blue..
Webbing Ribbon 25mm - Bottle Green..
Webbing Ribbon 25mm - Choco..
Webbing Ribbon 25mm - Anthracite..
Webbing Ribbon 25mm - Army..
Webbing Ribbon 25mm - Bordeaux..
Webbing Ribbon 25mm - Fuchsia..
Webbing Ribbon 25mm - Pink..
Webbing Ribbon 25mm - Purple..
Webbing Ribbon 25mm - Cobalt..
Webbing Ribbon 25mm - Aqua..
Webbing Ribbon 25mm - Orange..
Webbing Ribbon 25mm - Grass Green..
Webbing Ribbon 25mm - Lime..
Webbing Ribbon 25mm - Yellow..
Webbing Ribbon 25mm - Light Pink..
Webbing Ribbon 25mm - Sand..
Webbing Ribbon 25mm - Middle Gray..
Webbing Ribbon 25mm - Light Grey..